Whenever an international artist comes to Karachi, the entertainment-seeking youngsters and adults give a prompt response. They find these shows a source to take relief out of their daily busy lives. However, when news of a famous artist coming to the town takes round of the city, the frenzy waiting for the performance reaches new heights. Let us enjoy it; this is golden opportunity as such an international artist comes to the city after long time. 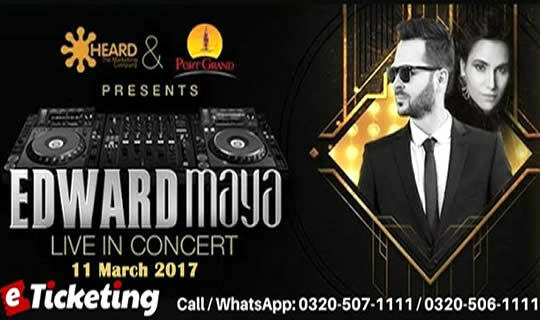 Stereo Love fame Edward Maya is coming to Karachi to perform at Port Grand Karachi on 11 March 2017 at 8:00 PM. Edward Maya is not new face for the Music industry. He made a great contribution, as a successful producer, in founding Romanian band Akcent’s album “No Tears”, which made a number of hits in Europe like “Stay with Me”, “That’s My Name” and “Lover’s Cry”. He got prominence with his distinguished style of music featuring sounds of accordion. He became global artist in less than a year after the release of his first single “Stereo Love” in 2009 also featuring Russian DJ VikaJigulina.